When investing for retirement, age 30 to 60, the aim is to accumulate capital. All investment income is re-invested, often tax free. The post-retirement phase, age 60 to 90, differs as the investor draws an annuity from the investment. 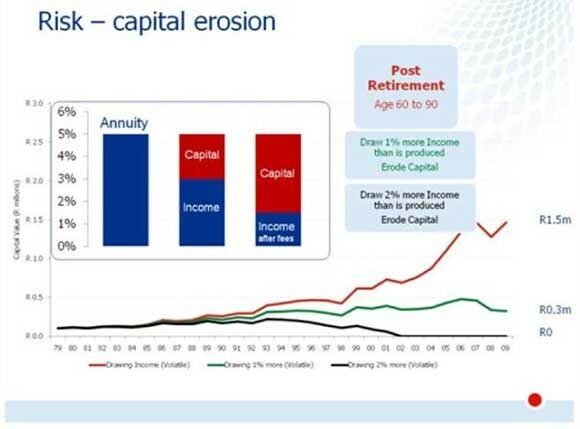 The real threat to the annuity lasting is capital erosion, best described by the level of annuity income exceeding the level of income produced by the selected investment funds. In post- retirement planning, the critical drivers are therefore the selection of investment funds that produce a reliable income and the avoidance of capital erosion. The chart alongside describes various outcomes from an investment of R100 000 made in 1980 into a balanced fund of 60% equity, 30% bond, and 10% cash. A retired investor who drew an annuity that equated to the income yield of the fund, after fees, would have had an average annual return of 9.4%, and today the investment would be valued at Rl.5 million. Had the same investor drawn an annuity of 1% more than the fund produced, the value today would be R300 000. 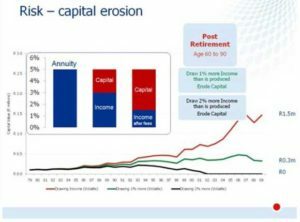 An annuity of 2% more would have eroded all the capital within 22 years. The bar chart represents a typical case of capital erosion. The first bar represents an annuity of 5% per annum. The second bar represents the income yield of 3% that may be expected from a balanced fund. The bottom section of this bar represents the annual capital erosion of 1.5%. The third bar represents the net yield from the fund after removing annuity fees. The point being made is that the likely capital erosion in many retired investor annuities is likely to be greater than 2%. This is however difficult to access, as most balanced and equity funds do not publish income yields.